I recently finished the carcass for a row of lower storage cabinets in my woodshop. The carcass will hold 6 columns of 3 drawers stacked on top of one another. The lowest drawer is designed to store tool boxes. It is almost 18" high. The full extension drawer slides make excellent use of the dead space in the cabinet. The user has easy access to the drawer's content when the slides are fully extended. The middle drawer is 6" high. It will contain containers of screws, material, boxes. The upper drawer is only 4" high. It will contain frequently used tools like screw drivers, saws, and smaller planes. Once the space is divided the drawer size needs to be calculated. Yes, calculated. 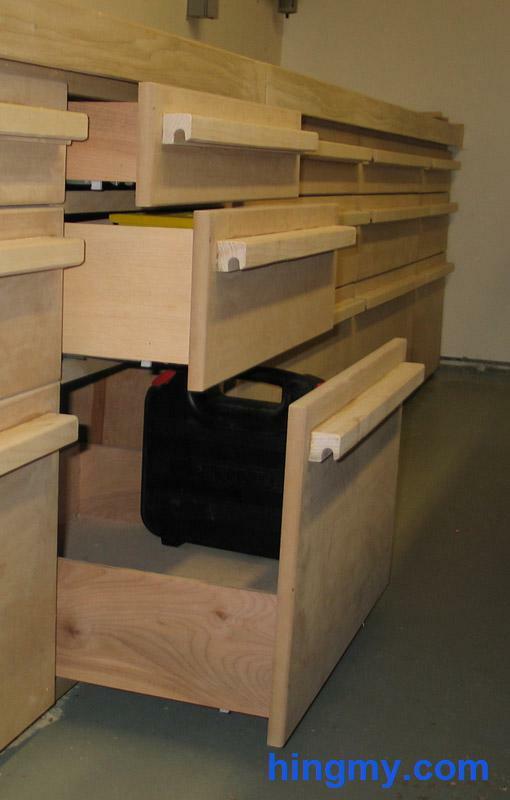 The drawer slides used to install the drawer dictates exactly how large the drawer must be. This cabinet uses blum undercount drawer slides, very high quality components manufactured in Europe. The drawer calculator for blum slides here at Hingmy calculates the exact size of drawer for any size opening. Details on how to construct the drawer can be found here. The drawers in this design use an overlay drawer front. An overlay front is essentially a flat panel that overlaps the face frame instead of being flush to the frame's front. If the cabinets were to be installed in a kitchen, the panels would use higher quality construction. For the garage a simple MDF panel with rounded corners will do. The panels have a uniform gap of ¼" all around. When installed in long rows any error during construction will show up as deviations in the width of the gap. Any deviation in the gap is easy for the human eye to pick up. The cabinet must be square, the face frame must be of equal length on all sides, the drawer slides must be level and square, and the drawers must be plum and level. A lot of things must be spot-on. Before installing the drawer front the drawer handles must be installed. Instead of purchasing long, expensive handles, I made my own on the router table. I used a "finger pull" bit to rout the profile of a handle into lengths of polar. I rounded one additional corner and installed the newly created drawer pull bars with glue and nails. The drawer fronts are attached to the drawers with 4 screws driven through the drawers into the backside of the drawer fronts. The difficult bit is aligning the drawer fronts properly. Begin in one of the lower corners. 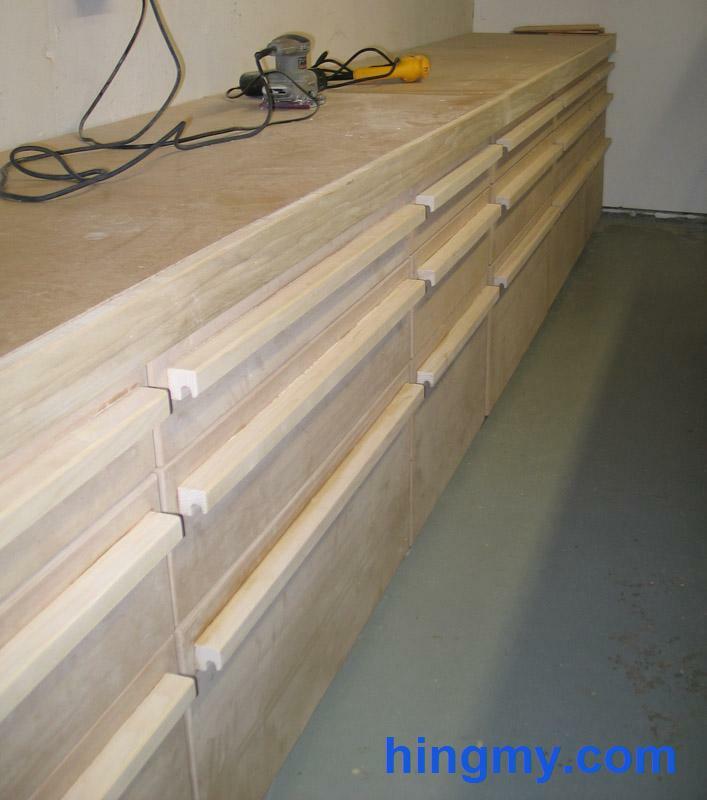 Level the drawer front with a level and set the reveal all around the panel with gauge blocks or a measuring tape. Tack the drawer front in place with two nails. Make sure the nails don't come out the other side. Open the drawer and drive the four screws into the drawer front. Take special care that this first panel is installed perfectly. Everything else will depend on it. Now that the firs panel is installed thing will go much faster. Cut a few shims of the exact width of the desired gap. The panel above the first is installed by placing the shims on top of the first panel and the new panel on top of the shims. Since the first panel was level, the second panel will be level to. If the cabinet carcass is true to the plans, the reveal on the second panel will be set properly simply by the fact that the panel is positioned correctly relative to the first. Repeat this process for every panel in the clumn. When you reach the top, move to the lowest panel one column over. Use a shim between the panels to set the correct horizontal distance. Again this technique will not work, if the cabinet is not built to spec. It is good practice to occasionally check a panel's position relative to the carcass. If you install six columns of drawers using only shims, the 6th column will have the accumulated error of six installations. It better to make a couple of smaller corrections on the panels in between. There you have it. A row of drawers. The blum slides work perfectly and the high capacity drawers make a world of difference in my shop. If your work is accurate and the design is good, building these cabinets is a breeze.